The best, greatest, craziest, biggest and funniest. Awesome South Africa will intrigue you, make you laugh, astonish and astound you. 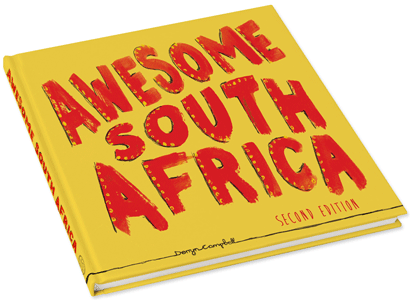 This entertaining compilation on South Africa is packed full of humour, history, interesting facts and trivia about South Africa and its people. This recently launched Second Edition is now updated with the latest information and statistics. The book, which has received rave reviews is a visual cacophony of all that is unique, exceptional, and noteworthy about South Africa: its heritage, its people and its heart. Irrespective of age, race or gender, the book is sure to be enjoyed by everyone – cynic and enthusiast.